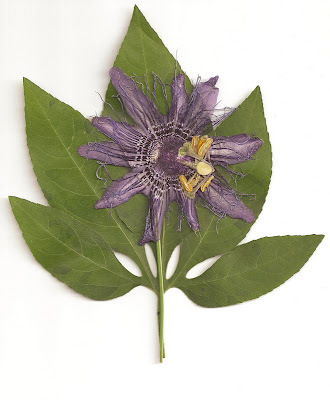 Incense Passion Flower and Datura. I am working on some entries to submit to a juried show for next year. 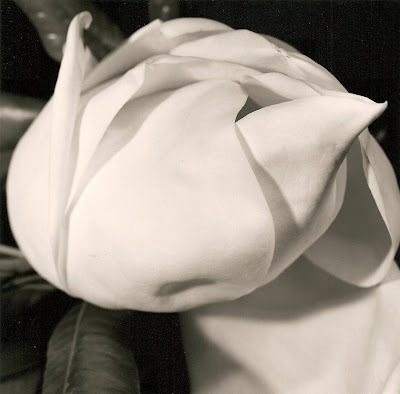 The theme is "Flora and Fauna" and I am looking at photographs that blend the two. Botanical images that suggest bird forms. 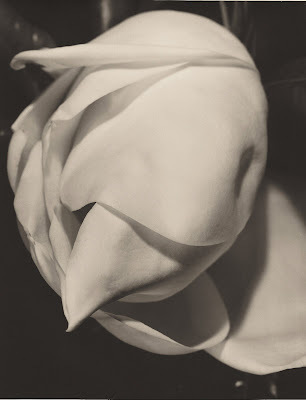 The Magnolia photograph I took with a 6x6 camera and I have been cropping it to 8x10 and then turning it on it's side. 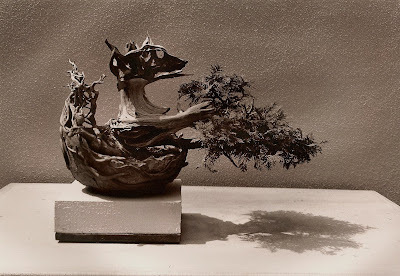 The Bonsai image is a little too obvious. Unfortunately while working with this negative I put a big scratch in it and so if I want to submit it I have to deal with prints I have already made. 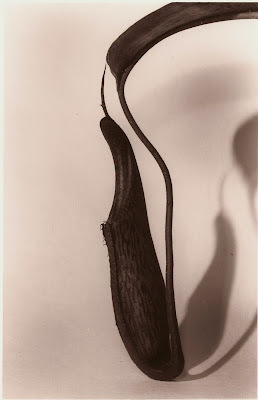 I have always liked the picture of the tropical pitcher plant trap and it's shadow. The shadow suggests a bird to me. I never intended any of these photographs to evoke bird like qualities. When I take a photograph I am never sure what it's going to look like until I print it. Perhaps this is where I am at in my photography or it's just the way I make pictures. I am never sure at the beginning when I make the decision to release the shutter just what the light reflecting off of the temporal world will reveal after it passes through the lens and settles in to the film. This weekend I moved my mat cutter to an unused room in our attic. Good light and I don't have to take over our dining room table. I worked on my first dual window mat with mixed results. Here is the picture I brought to the print presentation class. I did cut a mat for it but wasn't satisfied with the result. So I cut another one last week to fit this 11x14 glass frame. I am not sure if I like the proportion of mat to image. Another picture framed. 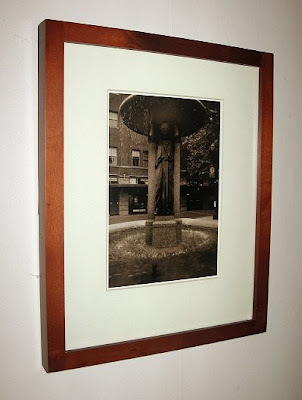 The next one I want to work on involves two square format images in a rectangular frame. So I'll need to cut two windows in a single mat. Yesterday I went to Goodwill looking for old frames for pictures. Lots of people have had crappy poster art framed in fairly nice frames. If I can find a good looking frame I can cut a mat to fit it. That is what I did with this one. Another weekend largely devoted to cutting mats including one fairly large picture that I found a frame for. 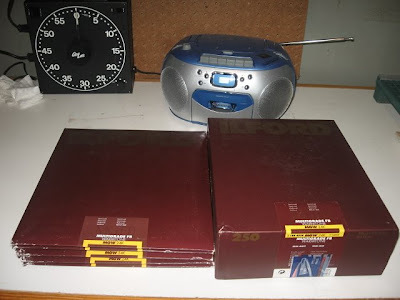 Plenty of Ilford Warmtone Semi-matte paper to last me awhile. I recently acquired a nice supply of this paper that should see me through till next Spring. Dry mounting my prints. 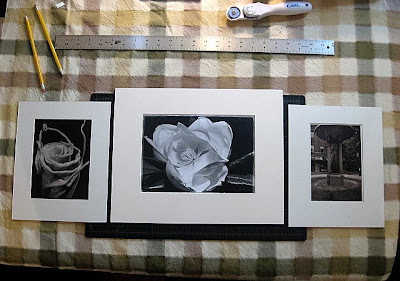 After practicing cutting mats for a couple of days I wanted to look at some finished results so I spent this morning dry mounting three different prints that I had cut window mats for. I pulled out the dry mount press I bought three years ago but rarely use. 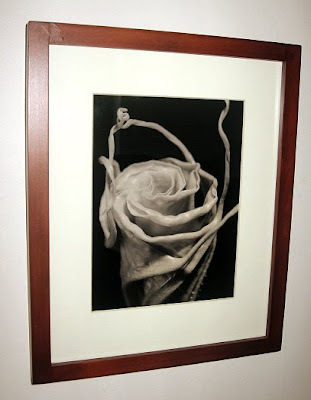 After watching a pro mount a print I felt this time I understood the process a little better and felt fairly confident. Make sure that there is no dirt on the back of the print or on the tissue or on the surface of the mount board. The first part of the job is fairly easy because all you want is to get a piece of dry mount tissue larger then your print tacked lightly to the back of the picture. 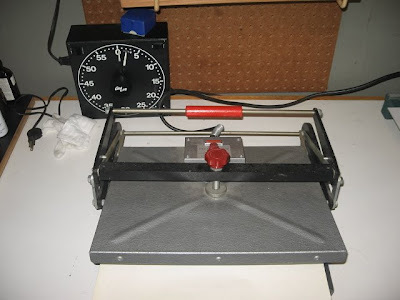 With the tacking iron and the press if you are unsure of the temperature start low and then adjust upwards in small increments to get the exact temperature you need. Tack the mounting tissue just enough to adhere to the back of the print so that if you lift the tissue the print will stay attached to it. Then cut away the excess. I bought this nice little circular cutter and a self healing mat after seeing it demonstrated at the workshop. I found it easier to use a larger sheet of tissue then the print and then trim it to size. 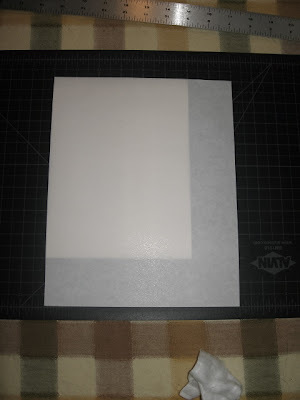 If you have an 8x10 or 11x14 print using a precut sheet of the same size may not cover the print completely so I noticed that having a sheet larger and then trimming it down to size made this job a lot easier. 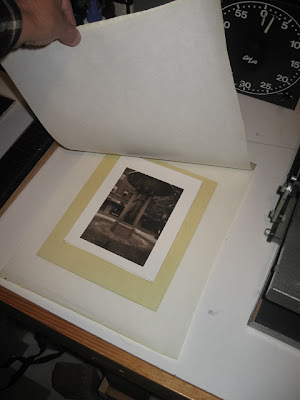 Once you have a print with a lightly tacked sheet of tissue that will fully cover the back of the print center the print on to the mount perfectly centered within the window of the over mat. Once you have it exactly where you want it lightly tack the tissue to the mount to hold it in place and hopefully the tissue is still attached to the print so everything is in position and will not shift when you place it in to the press. 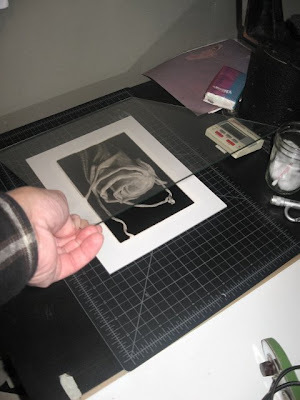 Place the window mat over and make sure that the picture is exactly where you want it because at this point if you only lightly tacked it to the mount you can seperate it and reposition. Now we can place it in the press. Set the dry mount press at a setting around 170 degrees which is the lowest setting on my press and let it heat up to the proper temperature. Some real nice ones have temperature guages but mine just has a little light like a waffle maker that shuts off when the proper temperature has been reached. 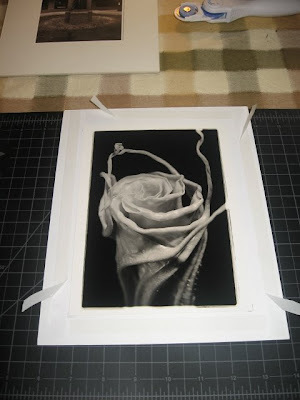 You want it just hot enough to soften the mounting tissue, and not too hot that you scorch the SILVER GELATIN print (this is a process for real photographs not ink jet prints I have no idea what happens to them if you apply heat to them). Make sure the platen surface is clean (before you heat it up) and that the pad that the print will rest on is also clean of any debris. 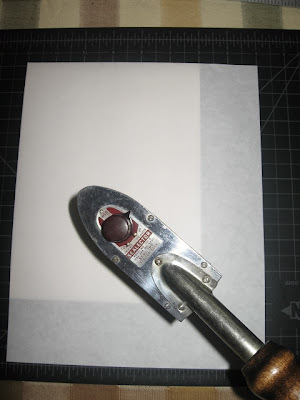 I place the print and mount between "release paper" folded in half to cover the whole print and mount front and back. Release paper can be bought through B&H in rolls and will protect the print while it is in the press. When the press is hot enough put the print and mount with the release paper and carefully close the press. You want the press to hold the print firmly against the mount. Set a timer for two minutes and hope for the best. After two minutes check the print to make sure it has adhered completely to the print. If it hasn't try adjusting the temp (up or down) and the time. This was the first time I think it worked perfectly after just two minutes and I had the press at it's lowest possible temperature setting. 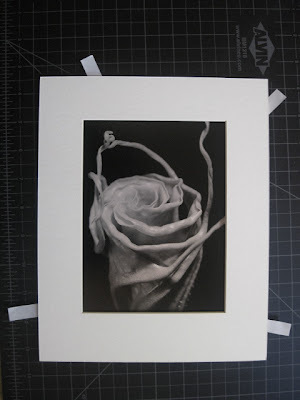 The print and mount need to be kept flat while the print and mount and bonding tissue cools. I used a clean piece of glass big enough to cover the whole print and let it sit there for a couple of minutes. The bonding of print to mount with the tissue happens during this cooling phase and so you need to make sure the print and mount are flat and pressed evenly together. To hold the mount and over mat together I used Letraset High Tack double sided tape that I found at Art Media. This will hold things together well and if you decide to change the window over mat you can still seperate it without doing any damage to the print. I bought some cheap but at least wood frames. After carefully cleaning the glass (and making sure it is dry) I put some little foam spacers at each corner of the frame so the glass will not be pressed against the mat or the picture. There might be a product for this but I used little pieces of weather stripping that has an adhesive back and will stay in place in the corner of the pictures. 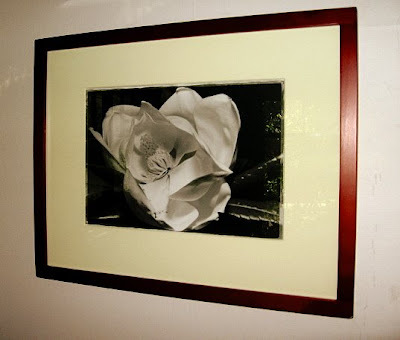 You should have an air space between the frame glass and the picture.